After importing IMAP folders into Exchange mailboxes, users often discover their mail is not visible. This is because the exported folders retained the properties and views associated with the IMAP account. The default IMAP view is Hide messages marked for deletion and Exchange doesn't support marking messages, so the view hides all messages. By changing the view to IMAP messages in View, Change View, the messages are visible. They are also visible if you view the folder in OWA. Imported folders will use IMAP views and say "Filter Applied" in the status bar, as seen in this screenshot, and of course, no messages are visible in the folder. To fix this, you can edit the folder property using MFCMAPI or change the property using a macro. Below are two macros, the first macro changes the only selected folder's PR_CONTAINER_CLASS property to IPF.Note if the folder type is IPF.Imap. The second macro checks the folder and subfolders. This version of the macro above will walk the folder list and change all folders from IPF.Imap to IPF.Note. This uses the folder picker and you can choose the root folder (top of mailbox) to run it on all folders in your mailbox or a parent folder to run it only on that folder and it's subfolders. To check your macro security in Outlook 2010 or 2013, go to File, Options, Trust Center and open Trust Center Settings, and change the Macro Settings. In Outlook 2007 and older, it’s at Tools, Macro Security. After you test the macro and see that it works, you can either leave macro security set to low or sign the macro. Open the VBA Editor by pressing Alt+F11 on your keyboard. Copy and paste the macro into the new module. I had to change from Imap to Exchange due to provider issues and couldn't see subfolders (which are many), some contacts and some dates on my mobile devices. After I used 2nd VBA Makro all mobile devices (Android, iOs) show the subfolder. all with property "IPM.Post". Dates are no longer visible on either mobile device. Is there a comparable solution for this issue. Thanks a lot for your valuable work. Awesome - only word for it! Legend you. Microsoft support said sorry just deal with it but the client was up my back to get is sorted. How many times in the past few years this website helped me? I can´t counter it! For my needs, your explanation about what was happening was enough and so on Outlook 2016, on the folder with no mail, I went into the "filter applied" sign, clicked, advanced and removed the status imap filter. Thank you again for your beautiful work! It took me long time to find the solution. Worked perfectly with subfolders one Outlook 2016. Hi, when I run the macro it says the schemas link doesnt work. Just out of interest, what is the macro getting from this website? From this website: "http://schemas.microsoft.com/mapi/proptag/0x3613001E" ? It doesn't go out to that site - its used to identify the property. Hi all. I know this is an older thread but hoping someone here has solved a related issue I'm having. 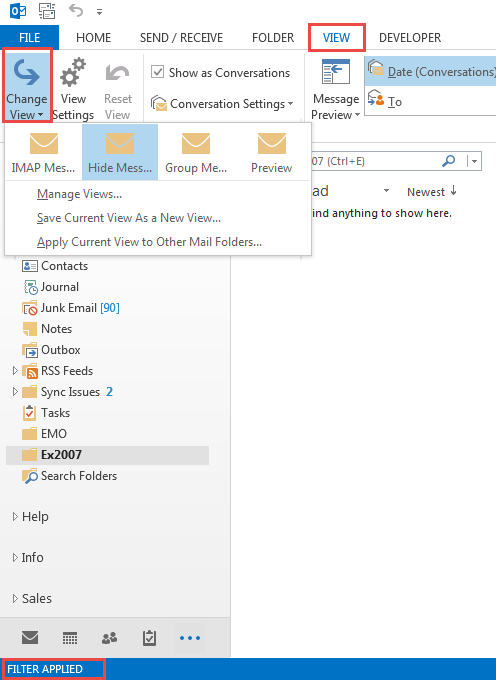 The follow-on issue I have is that any NEW folder I create is still automatically created as a "Folder containing IMAP Items" instead of a "Folder containing Mail and Post Items". I was expecting the new folder to inherit the settings of the parent folder but it seems there is a default setting held somewhere else? Has anyone else experienced / solved this? run it on the top level folder - what is the folder type? run it on the parent folder is you are creating a subfolder - what is the folder type?